When an air pressure switch is actuated, it will either produce an alarm or automatically open or close a valve to interrupt or continue the flow of air. Air pressure switches are programmed to automatically respond when the pressure either falls or rises to one or more set points of pressure, or actuation points. Most of the time switches are programmed so that the actuation points are triggered either by pressure fall or pressure rise. For example, air compressor pressure switches signal to the compressor to turn on when pressure falls below a certain base level, and signal to the compressor to turn off when pressure reaches a certain ceiling level; nothing is triggered when the pressure rises above base level, and nothing is triggered when the pressure falls below the ceiling level. 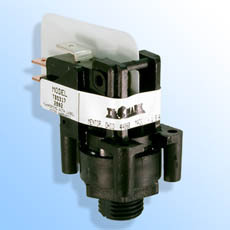 In this way air pressure switches are capable of regulating gas systems to keep them within a specified pressure range. There are a number of different types of air pressure switches, including adjustable pressure switches, air compressor pressure switches, differential pressure switches, furnace pressure switches, high pressure switches, low pressure switches and vacuum switches. Air pressure switches are widespread and versatile, being designed to work in any compressed gas environment. These switches come in a variety of forms, including as a sensor or chip, a transducer, a meter, a gauge, or a controller. Some air pressure switches use mechanical devices to sense changes in pressure, for example using an elastomeric diaphragm in a pressure cavity, while others rely on piezoelectric or piezoresistive electronic sensors. Air pressure switches have a variety of uses in many different industries. Air pressure switches are important for the secure operation of filters, furnaces, blowers, generators, cars, compressors, turbines, process equipment, air pumps, panels and gas lines. Air pressure switches are especially useful because they are a safe and cost-effective alternative to safety relief valves. Air pressure switches, unlike safety relief valves, can detect when pressure begins to leak during operation and will either send an alert or automatically shut down the process until the trouble is fixed and an operator restarts the operation. Industries that make use of air pressure switches include process manufacturing and assembly, CNC machining, automotive, appliance, and utilities. Air pressure switches have an important part in making processes that use compressed air consistent and safe. 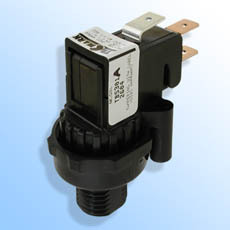 Air Pressure Switches Air pressure switches help control air flow and pressure by sensing changes in pneumatic pressure and responding in a predetermined way.